Elias Brinks is co-Investigator of THINGS. One of the key scientific drivers for embarking on the THINGS project is the desire to understand the fine scale structure of the interstellar medium (ISM) and how this varies as a function of galaxy (Hubble) type, metallicity, star formation rate, etc. Previous studies have shown that massive stars, via their stellar winds and as a result of them exploding subsequently as a supernova, can shape their immediate surrounding. Because massive stars form usually in clusters, these effects accumulate and large, coherent structures can form in the ISM. These structures, in principle expanding bubbles of coronal gas, reveal themselves in 21-cm maps of neutral, atomic gas as expanding shells or holes. One of the aims of THINGS is to relate porosity of the ISM as traced by the HI structures to current and past star formation, to determine the energy balance in the ISM, to link this to the observed velocity dispersion and characteristics of turbulence in spiral galaxies, and lastly how swept up material in these expanding shells can trigger subsequent generations of star formation. Figure 1 is an illustration of the rich structure in the form of HI shells and bubbles in the ISM of two THINGS targets, NGC 6946 and NGC 3184. Figure 1: Comparison of VLA HI (red) and Spitzer Space Telescope 8 µ maps (green) showing a stunning correlation between the structure in the ISM seen at these two different wavelengths. THINGS clearly demonstrates that the ISM is dominated by giant shells and supershells, ranging in size from the resolution limit to up to kpc size. The most widely accepted view on how these shells form is that the combined effects of stellar winds and supernovae originating in an OB association or super star cluster (SSC) deposit vast amounts of energies within a small volume over a short time interval resulting in a pressure-driven, expanding shell. GMCs can form within the accumulation front of shells and supershells. From recent CO maps (LMC, SMC, IC10) there is now growing evidence that GMCs do indeed form on the expanding rims of shells, or within the interface where two expanding shells run into each other (see Figure 2). IRAM Plateau de Bure observations have been allocated to study a few small areas in some THINGS targets in detail in CO to investigate the relative location of GMCs with respect to the HI shells and supershells. Figure 2: CO column density map (blue) overlaid on a VLA HI map (red). The CO traces cold, molecular hydrogen, i.e. regions which are likely to collapse under self-gravity and produce stars. Notice how those regions seem to concentrate on the rims of HI shells. 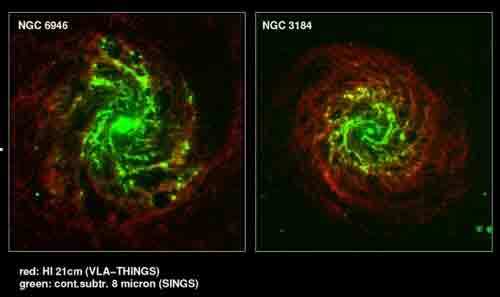 Spiral galaxies are thought of as having a well-defined boundary. Observations at 21-cm wavelength of the atomic neutral hydrogen gas in the disks reveal two important facts: the HI disks extend far beyond their optical counterparts and they are sharply truncated. 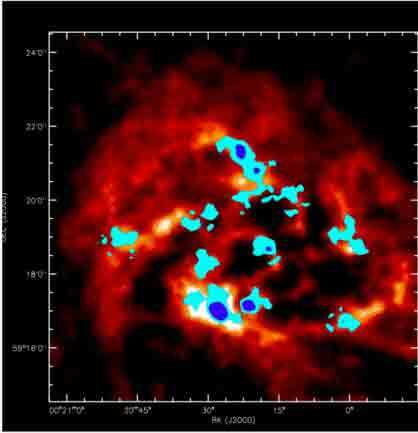 In the literature this has been ascribed to the extragalactic radiation field acting as an ionising agent of the outermost reaches of a neutral gas disk. Based on an analysis of 9 galaxies observed as part of the THINGS survey, we find that the outermost HI structure remains at a near constant 1020 to 1021 atoms cm-2 to then rapidly turn over. This turn over occurs at column density levels that are deemed too high for the extragalactic radiation field to have any serious effect. Instead, observations seem to point towards the galaxies having a well defined edge as they simply run out of baryonic material. This assertion is supported by simulations in the literature. The study of HI in large spirals is now being extended to dwarf galaxies in a survey known as LITTLE THINGS, to probe the low-mass, low-metallicity regime. It is expected that several of the relations found or confirmed in big spirals will break down in that low-mass regime. An example of such a relation is the Far Infrared, radio continuum relation (FIR-RC, for short). Heesen and Kitchener, together with Brinks, are engaged in a multi-band radio continuum study of several dwarf galaxies. They have created the deepest radio continuum images to date at C-band (5 GHz), reaching down to 6 µJy. Figure 4: Left: C-band (5 GHz) radio continuum overlaid as contours on a Spitzer 24µm image which is a tracer of recent, massive star formation. Right: same as the left panel but instead showing L-band (1.5 GHz) contours.